As I mentioned in my previous post, I am planning to post a weekly Fashion Bargain Find (FBF). 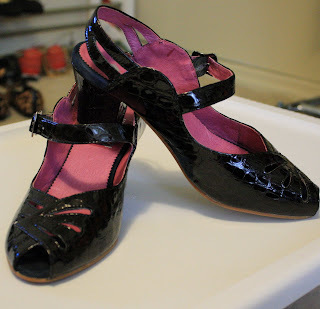 Last week I scored a very cute vintage inspired pair of shoes. Shoes are from Farlyrobin, I had seen the brand a few times before but was not familiar with it. I did some research and found out Farlyrobin retails from about $100-$300 a pair. My pair was a score at $10 at Loehmann's in Long Beach. I'll break it down to show you how I was able to get a pair of $180 retail pair of shoes for only $10!!! Shoes retail for $180, at Loehmann's they were selling for $39.99, were marked down to $29.99 - 20% off. I had a email from the Loehmann's Insider Club that I joined for a secret sale, at the register I mentioned secret sale and was given a coupon for an additional $10 off my purchase. Also because I am a member of the Insider Club at Loehmann's I got an email for my birthday which is in May for 15% off any one purchase during my birthday month. So there you go after all the discounts and coupons I paid $10 for a pair of designer shoes. So I hope you have been able to find my tips and rules helpful. Go out and get your own Fashion Bargain Find. If you want to share your FBF please email me and I will post it on my blog. oooh these shoes are just cute!! !